An indulgence for supper, which can also be served as a stylish starter for six if you double the quantities. Bring a large pan of salted water to the boil while you cut the asparagus in half lengthways. Add the spaghetti to the water and cook according to the packet instructions. 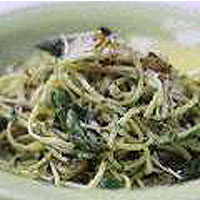 Five minutes before the pasta is ready, pour the olive oil into a non-stick frying pan and set over a medium-high heat. Fry the asparagus for 3-4 minutes, depending on its thickness, then add the garlic, chilli flakes and herbs. Continue to cook for a further minute or two. Meanwhile, drain the spaghetti, giving it a good shake before tipping into the hot asparagus. Add a generous twist of freshly ground black pepper and toss thoroughly before serving immediately with the lemon wedges and lots of freshly grated parmesan.